Want Meaningful Work? What Are You Waiting For? Look how psyched this guy is to start on his new path! Many of you email me that your work feels petty and meaningless. You say it’s combative for the sake of being combative. It doesn’t connect with anything you care about. You’re unhappy. You’re wishing you could be doing something else. Well, the horrific attacks in Paris this weekend have silenced that little voice. We all hurt for the victims of that disgusting violence. Anyone with a trace of empathy could picture themselves in the shoes of those victims. As someone who spent years in the music business, I can’t even count the number of nights I’ve spent in rock music clubs. Add in the nights as a band manager where I worked the concert merch table to help sell my bands’ t-shirts and CDs, and the whole nightmare hits way too close to home. Life is so short. That’s what I heard in my head all weekend as I watched news coverage or thought about the brutal attacks. That could have been you or me lying in a pool of blood after going out for a fun Friday night. What if that was you, in your 20s, 30s, 40s, your life cut short by religious extremists? If you had the opportunity to reflect at that moment, how would you feel about the way you’ve been spending your professional time? We often live like we’re in some kind of dress rehearsal for the real thing. We spend our time doing one thing while we keep putting off the things we really want to do for “later”. But this isn’t a dress rehearsal and we don’t necessarily get a “later”. My college roommate was in his medical residency in New York when we were 27. He assumed his back ache was a pulled muscle from weight lifting in the gym. Turned out to be colon cancer. He died at age 28. My dad’s best friend came home from lunch not feeling well on my first day of 10th grade. During that lunch hour, he dropped dead of a heart attack. He was 43. Just a decade ago, when my mom was 57, she had sharp pains in her neck. The doctor thought it was arthritis. It turned out to be lung cancer that had spread through her spinal cord. She’d never had a cough and had quit smoking at age 35. She died at age 58. Morbid enough? There’s more. In the past year, I’ve had 3 good friends with close calls. One came down with a bad cough at Lollapalooza in Chicago. A month later when the cough hadn’t gone away, tests revealed a tumor on her lung. It wasn’t lung cancer, but it was a cancer. They had to remove 1/3 of a lobe of her lung. Another friend (who is also a JDCOT video guest) was watching the Superbowl this past February when he suddenly got double vision. He went to the hospital, only to learn that he had a rare cancerous tumor on his brain stem. A week later he had major surgery. Another friend recently had an itchy mole removed. Turned out to be cancer. He had to have surgery to remove a chunk of his back and his lymph nodes to be sure it hadn’t already spread through his body. All of those friends are lucky. Although they were randomly struck by bad news, they also randomly caught their situations early and are now fine. But what if this was you? All of these stories, from tragic events to health issues, should remind us that our time here is limited. How does this concept impact the way you spend your time? Consider this: before you travel somewhere, you probably think about how you’re going to spend your time at your destination so you can maximize it and get what you want out of that trip. Why not treat your life the same way? Before starting JDCOT, I asked myself how I’d want to spend my professional time if I won the lottery and money was no longer an object. I also asked myself how I’d want to spend my professional time if I knew my days were incredibly numbered. I concluded that I wanted to help lots of people. I wanted to share whatever I’d learned through being a legal recruiter and always pursuing careers that matched my interests and strengths. I wanted to have my own interview show. I wanted to help people by incorporating voices beyond my own. And finally, I wanted to leave something behind that could be helpful on an ongoing basis. You can similarly take your own inventory. Taking a step back from your frustration and analyzing what you see in the mirror is the best first step to figuring out what you want to do next. What you learn about yourself can guide you to work you would find meaningful and to a situation that aligns with the life you want. 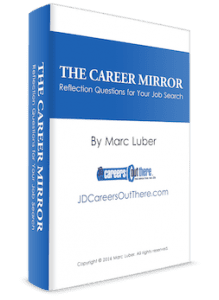 To help you take the first steps of looking in the mirror, I created The Career Mirror, the free JDCOT self-assessment questionnaire . 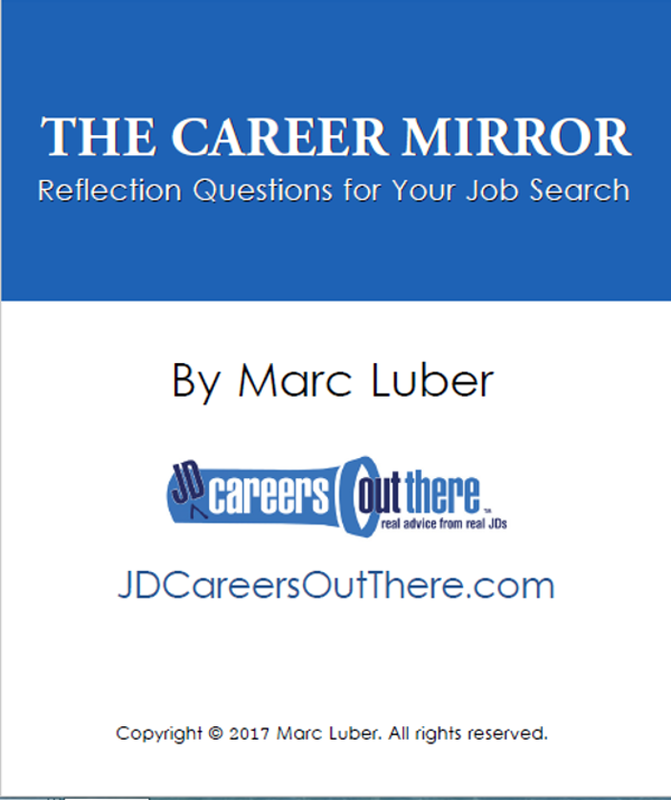 The Career Mirror has you assess your current work situation to see whether your dissatisfaction might stem from your current boss or place of employment, as opposed to the actual work of being a lawyer. 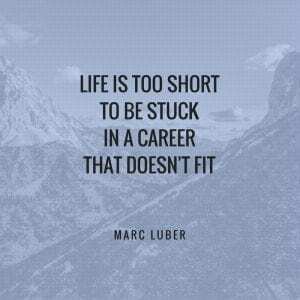 Then it has you dig deeper to look at what you have to offer and what you’re looking for in future work opportunities. As you dig even deeper, you can look at some of the heavy issues like what you want out of life. Do you really need to maintain your current salary and lifestyle? Or might you be happier and healthier reducing that lifestyle and doing something you enjoyed more but paid less? 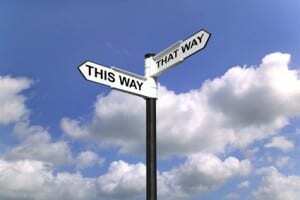 Until you learn the realities of the alternative careers for lawyers that interest you, you won’t know whether you would actually need to take a step back financially…or how significant that step back would be…or how temporary it would be. These are all the types of things we look at in my JD Refugee® class. For now, don’t let your worries get ahead of yourself or freeze you in place. 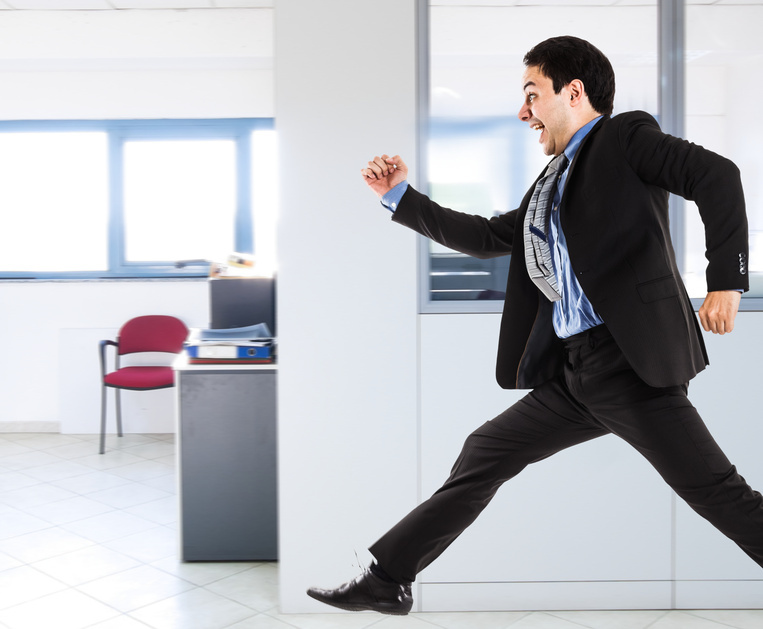 Rather than getting overwhelmed by thinking about all of the details of looking for a new job, leaving your current job, and making a major change, break the process down into bite-size pieces. Take the first step by checking in with your self and asking some important questions. If you were told today that your days were numbered (they’re already numbered, but I mean numbered), and you had to do something professionally (you can’t just drink umbrella drinks on a paradise-like beach), would you be satisfied knowing you spent them doing the work you’re doing? How would you want to spend your professional time? 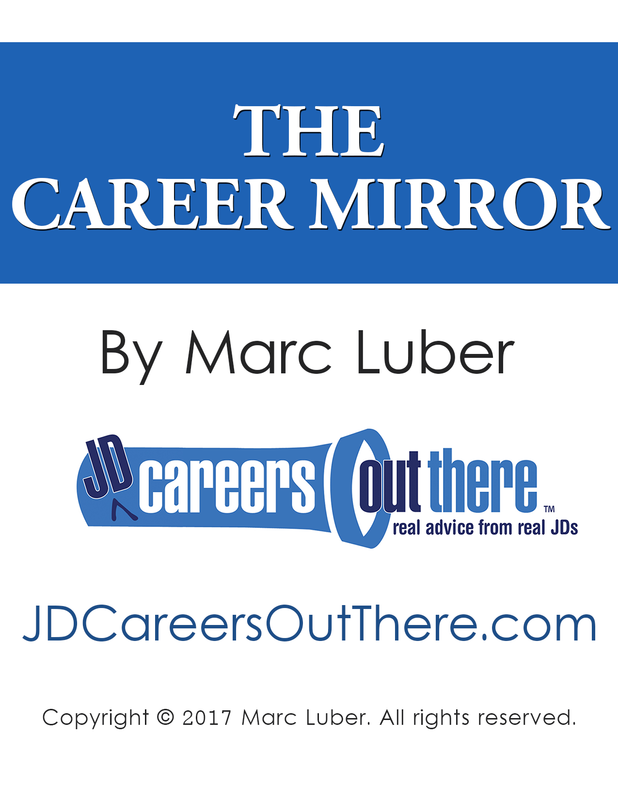 For help taking your next step, you can visit our page for unhappy lawyers, download the Career Mirror and begin receiving additional guidance by email. Life is short, so make the most of it! Next | What Careers Do Lawyers Most Commonly Transition To?